Established in 2013, we, Buildcon Designers LLP is a trusted service provider engaged in offering Pre Engineered Building Designing Service, Structural Shed Designing Services and PEB Detailing Services. Our professionals are dedicated towards their respective works and ensure smooth functioning. The services offered by us are precisely rendered as per the precise needs and requirements of clients. Our offered services are widely demanded by our clients owing to their reliable working, low prices and user-friendly nature. The entire range of services is rendered in complete adherence to the set industry standards.d user-friendly nature. The entire range of services is rendered in complete adherence to the set industry standards. We are always focused towards meeting the precise needs and demands of our clients by offering them superior quality services. Our timely executed services have helped us to gain huge client base across the nation. One Roof Solution for Pre Engineered building Services. Gain and maintain a leadership position in the market. Meet the high-performance requirements of the market. Promoting growth and a safe work environment. 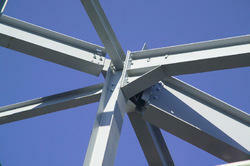 We offer Structural Steel Connection Design services to Contractors and Fabricators.